In healthcare today, patient financial responsibility is on the rise. Patients are increasingly responsible for a higher percentage of their own healthcare costs. This is the result of employers shifting those costs to employees, and insurers offering high deductible health plans which increases out-of-pocket expenses. Simultaneously, it's also harder for healthcare organizations to get paid for the care they provide. Claims clearinghouse InstaMed reported that 76 percent of providers surveyed said it takes more than a month to collect from a patient, with 56 percent citing patient pay balances as their top revenue cycle concern. Why offer Patient Payment Estimates in advance of care? Download this Self Pay Guide immediately & save it for later! Download this Self Pay Guide & save it for later! 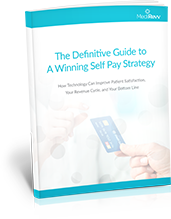 Please fill out the form to receive a PDF version of The Definitive Guide to a Winning Self Pay Strategy—right away. Patients typically do not receive complete or accurate (or sometimes any) cost information prior to or at the point of care. While we would never allow a mechanic to work on a vehicle without a clear idea of costs, this very scenario occurs every single day in healthcare. Except, it is changing. Estimating accurately is hard, but new technologies are making it possible, easier, and more patient friendly. If you're asking why you should look into estimating solutions, here are three good reasons. The most obvious reason to provide estimates to patients is that they will ask for them. 59% of consumers will choose a less expensive care option when comparing costs. Consumerism in healthcare is increasing, and with the steady rise in high deductible health plans, patients are becoming more knowledgeable and are looking to become more informed about their cost of care. It’s the provider’s responsibility to not only provide exceptional healthcare but also to meet the patient’s financial expectations. Patients want to know what they owe, and they are typically willing to pay the fair amount for their medical expenses, but today, they are more likely to price shop for their healthcare. But providing estimates comes with a hefty responsibility to communicate often and clearly with the patient. Especially as the cost of care has increased 195% from 1997-2016! What happens when the estimate is different than the actual cost of care after the service is delivered? 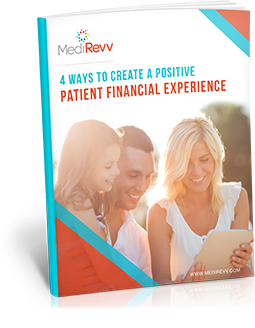 Well, be sure that every possible scenario — good, bad, or neutral — impacts the patient financial experience. If the estimate is low and the bill is high, the inaccuracy may be attributed to a variety of reasons: perhaps a portion of the deductible was previously paid, or the procedure performed differed from what was originally planned and estimated. If communication is strained between the patient, the care team, and the billing office, dissatisfaction can cause patients to lose trust in a provider. Conversely, if the patient overpays, a credit balance may result on the account. While most people are usually relieved to find they owe less, credit balances create their own set of issues. The cost of care has increased 195% from 1997-2016! Providing an estimate is so much more than sliding a paper with numbers across the table. Hold a conversation, entertain the "what if" scenarios, answer any questions, and update the estimate any time the treatment plan changes. The level of healthcare-related bad debt is rising quickly. Patients are often surprised to learn that they owe providers anything out of pocket. “Doesn’t/shouldn’t my insurance pay for this?” they ask. As a result, an increasing volume of patient balances transfer to collections. The good news is that patients who are informed about their financial responsibility are actually more likely to pay. While this translates to fewer self pay resources used to collect on the back end, it’s also a sound reason to provide an estimate at the outset. A patient payment estimator helps start the conversation about the out-of-pocket expenses a patient will incur. It allows healthcare organizations to potentially collect the balance, or a portion of the balance owed in advance of the visit, especially for non-covered services. It also creates opportunities for your staff to discuss financial options like holding a credit card on file and setting up payment plans with the patient. When expectations are clear and options are provided, the likelihood of collecting payment increases. You can equip your pre-visit work team with technology tools to help with conversations surrounding patient responsibility. So how does it work? Estimating technology simplifies this process by quickly pulling data to calculate not only what the patient’s out-of-pocket responsibility will be, but also the patient’s propensity-to-pay score. This can be done long before the patient steps through the door, in turn eliminating touches to an account on the back end. Additionally, estimating technology queries the payer website to check eligibility. This allows your representatives to ask for updated insurance information if necessary. The estimator is integrated with the host billing system and the payer so it is able to account for coordinated care. That is, future scheduled visits and current claims with the payer are considered in the estimate for patient responsibility, allowing for more accuracy of what the patient will owe. The technology can even qualify patients for presumptive charity care much like propensity-to-pay technology, but prior to the visit. Typically, the statements generated by provider billing systems are very confusing, which results in patient frustration and dissatisfaction. Obviously, in today’s competitive healthcare environment, no provider wants that challenge. We’ve broken it down here into five components that are integral to the end-goal of making statements patient friendly. Click on the numbers to read more about the section. There should be no question who is sending the statement. The reader’s eye should first focus on your brand identity (logo) and then be drawn to the balance due. Design your statement and use color to call immediate attention to these two most important points of interest. 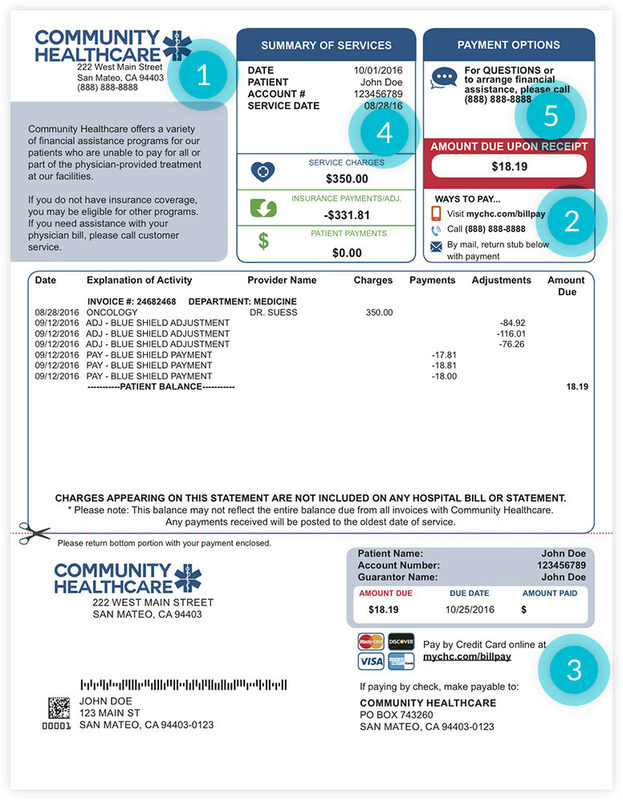 Clear instructions explaining the multiple ways your patients can pay reinforces how easy and convenient you make the financial experience for your patients. This is especially true when you offer self service options such as mobile payment apps, payment IVR and an online payment portal alongside more traditional options like calling to speak with a patient representative to resolve payment or mailing a check. Your patients’ payment preferences vary, so your payment options must also vary. Make sure that the contact number for the billing office is prominent, with wording that makes it clear that it is for questions. With smartphone technology it’s important to include mobile payment applications that use QR codes (quick response matrix barcode) as the first option to make payment. This increases convenience and makes the statement look clean. To mitigate the risk of theft, misuse, or unauthorized access to credit card data, eliminate the credit card box. This also encourages patients to either call to make a payment or use a payment IVR or online payment portal, which gives you access to their cash days faster. This action also reduces the PCI compliance risk, enhancing patient financial safety. The distinction between payer payment, contractual adjustment and the patient responsibility needs to be apparent on the statement. It’s imperative to clearly list the details of what was billed, the payment amount approved by the insurance, the contractual adjustment and what the patient owes. Patients are frequently confused about what portion of their care was paid for by their insurance and the explanation of benefits is often misunderstood to be a bill. Clarifying the difference and minimizing patient confusion, United Healthcare leads the charge for insurance payers to reduce paper statements and increase payment options by offering creative online payment services on behalf of the provider. As patient deductibles continue to rise, a main source of worry for patients who receive a large balance bill is wondering how they will meet their patient responsibility. Providing payment plan solutions and referencing your online payment negotiator or a phone number to call to discuss potential financial assistance alleviates immediate patient concerns and informs them that there are other options available. To sum it all up, it’s somewhat of a balancing act to offer enough key details, without patients becoming overwhelmed. The patient should be able to quickly understand who the bill is from, what they owe, what it is for, and their payment options at a glance. Clear, eye-pleasing, easy to read yet detailed patient billing statements are a key component to creating a positive financial experience for your patients. How do your patients pay their bills? Or perhaps the right question is how do they want to pay their bills? Nearly two thirds of consumers expressed interest in using mobile payment systems, like Apple Pay, for healthcare bills. No one will argue that medical billing takes the cake when it comes to complexity. As a result, patients are asking more questions and showing more of an interest in how and when they pay. For 30% of patients, the increased HDHPs have resulted in higher out of pocket expenses . Around 70% of patients are able to pay their medical balance in full. For the other 30%, the increased high deductible health plans and other changes in insurance coverage have resulted in higher out of pocket expenses for patients. This means more patients interact with the business office than ever before — and more self pay dollars are on the table. 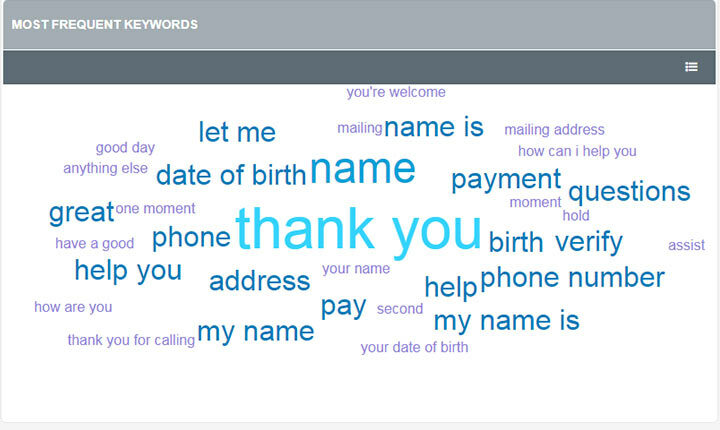 Some patient populations prefer patient statements (see below), but the shift toward online payments allows patients to be in control of when and how much they paid for their medical expenses, improving their overall financial experience. And for you? An online payment portal improves your revenue cycle performance. The volume of self pay accounts you are handling will only increase, so widening your payment options means you’ll receive payments in a more timely and efficient manner and reduce days in A/R, all the while meeting patient expectations. 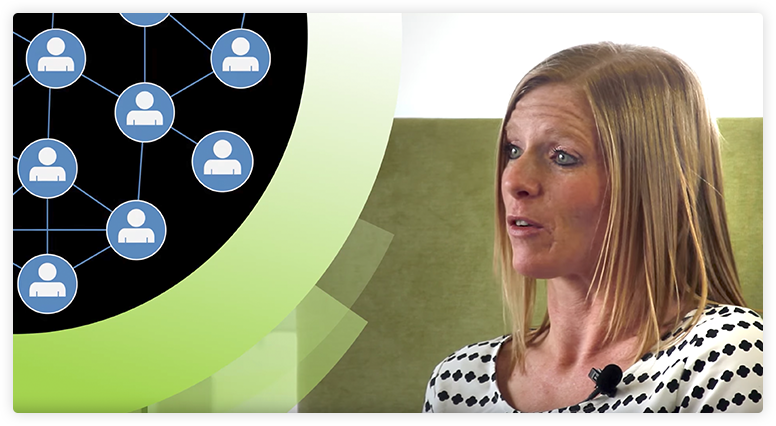 Deliver a holistic, proactive patient experience on every call. Branding: A customized website that reflects your branding – or can be integrated into your existing website – will help patients feel safe and comfortable when using the portal. Self-Enrollment: This feature helps patients save time by providing the convenience of online bill pay and access to billing statements and other documents. Flexible Payments: Offering a variety of 24/7 on-line options will decrease your call volume and free up resources. Patients should be given the option of making payments using credit cards, debit cards or bank accounts. They should also have the ability to easily set up one-time or pre-authorized payments, enroll and manage payment plans and be able to view their payment history. Communication: Patients should be able to securely communicate with you through PCI compliant phone support, e-mail or live online chat. A system that provides electronic receipts to the patient through e-mail is environmentally friendly and saves on mailing costs. Support: A good payment portal will provide your staff access to patient payment histories as well as the ability to take patient payments at point of service or over the phone and manage patient inquiries related to bill payments. Reporting: Comprehensive reports related to insurance information updates, transactions, settlements, etc. can be used to document payment trends and estimate expected revenue. The payment IVR is a touch tone response system, available on-demand. When the patient calls into your business office he is given the option to make a payment by phone. After keying in and verifying the account number, the patient enters the amount of his payment followed by his credit card number over a secure connection, and the payment is received. Simple. Some patients prefer to pick up the phone to pay their balances. Without Patient Interactive Technology (IVR), the patient is limited to call and speak with a representative during standard business hours, often times while they themselves are at work. An alternative is a payment IVRs which is available 24/7 so that patients can pay at their personal convenience without interacting directly with a representative. The IVR is incredibly easy to use and directions can even be included with your patient statements! In addition to the convenience factor, your organization will collect more self pay dollars, and free up the phone lines for those patients who require live assistance from a representative. Adding a payment IVR first and foremost gives your patient control over how and when they pay, which translates to high patient satisfaction rates. It also results in reduced inbound call volumes, lower call abandonment rates and shorter wait times. Perhaps most importantly, it frees your patient representatives to handle more complex calls — those where a conversation, patient education or other explanation are required to move the patient toward resolution on his account. Patients are continually asking for faster and more convenient ways to make payments, and the IVR allows just that. Payments can be made 24 hours a day, 7 days a week and 365 days a year from a mobile or landline phone in English or Spanish. Not only do patients no longer have to “hold,” they also don’t have to speak with anyone to complete the transaction. While the application of payment IVR technology in medical billingis relatively new, it’s not a new concept for patients who pay other bills by phone, so there isn’t even much of a learning curve. For patients who choose not to set up automatic payments but wish to make payments regularly, the payment IVR offers control, ease of use and peace of mind. 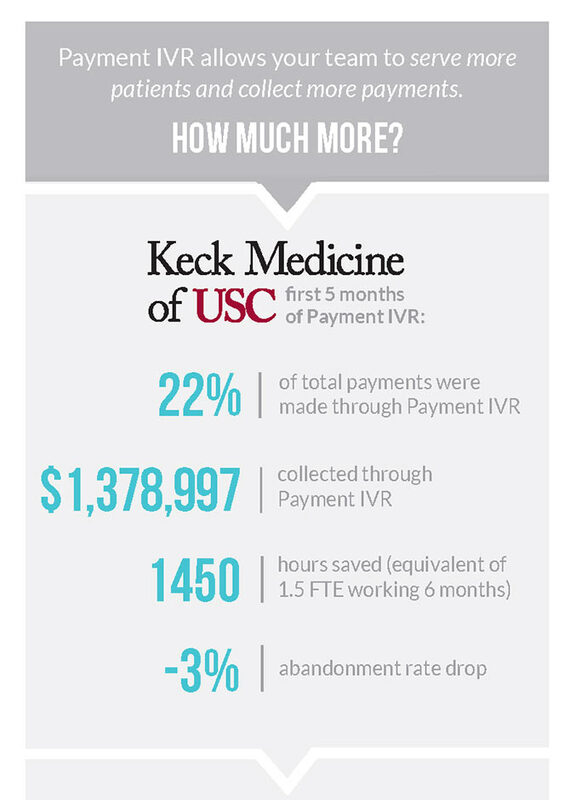 Keck Medicine of USC’s 6-month results with a payment IVR tell the story in numbers that revenue cycle leaders can understand. And we’ve seen outstanding results, most notably a big increase in patient pay revenue capture. 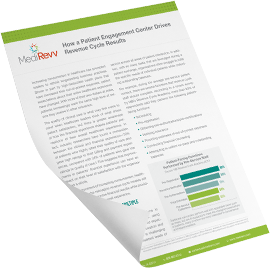 A solid stratification and prioritization plan is one more way to positively influence your revenue cycle. Why is this necessary? Because it’s both unrealistic and non-beneficial to try to contact 100% of your patient population with the same intensity. Stratifying your accounts is a “numbers and columns” way to improve overall cash collections. The idea is not to dismiss any portion of the outstanding accounts, but instead to put more effort into those accounts with a higher probability of success. For example, a patient who owes just $150 is more likely to pay in full with a credit card over the phone than is a patient with no insurance and a balance of $5,000. Your first patient call should be included in a high-payment-probability campaign, while the second patient might qualify for a payment plan/ financial assistance campaign. This segmentation leverages your ability to focus on a specific patient population with common outcomes, resulting in decreased overall talk time and increased daily productivity. To maximize results with your patient follow-up program, an account segmentation and smart analytics strategy is imperative. Good propensity to pay technologies will classify, or score, accounts according to value and liquidity to identify where the greatest return lies for self pay follow-up effort and drive best practice workflow efficiencies. How that score is obtained, however, as a large bearing on patient-friendliness. Look for technologies that leverage aggregated consumer data along with predictive modeling variables, as these can yield as much as 80% of the revenue with the least amount of effort. Perhaps most importantly, be sure that the technology you select is completely transparent to patients with no credit scores utilized. Doing so enhances the patient’s overall billing experience. According to the findings reported in the Kaufman Hall 2017 State of Consumerism survey, many healthcare organizations have missed the mark on delivering a positive patient experience. Seventy-two percent of the 125 hospitals surveyed fell within the bottom tier for patient billing efforts, and only 3% ranked in the top tier. On an up-note, though, there is no lack of interest in improving, as the findings also show that 90% of healthcare organizations realize that enhancing the patient experience is important to their bottom line. Implementing speech analytics into a functional quality assurance program can be a daunting, time-consuming, and highly complex task for healthcare organizations that requires both technical and operational expertise to produce successful outcomes. But it’s well worth the effort, as a well-integrated speech analytics platform serves as a natural complement and enhancement to an exemplary patient experience? 72% of the 125 hospitals surveyed fell within the bottom tier for patient billing efforts, and only 3% ranked in the top tier. Speech analytics technology records, monitors and analyzes all patient interaction calls — scheduling appointments, care follow up, billing inquiries, collecting payments and more — making it easy to adhere to best practices, reward positive interactions already taking place, and identify areas for patient representative training. Speech analytics makes the quality assurance assessment faster, easier, and significantly less subjective. The key to consistently adhering to all compliance guidelines is identifying in real time when a breach occurs or even a potential compliance issue and resolving it quickly. Since speech analytics automatically records and indexes all patient interactions, it’s easy to comply with audit requests and provide proper, timely documentation. It’s clear that healthcare organizations have a strong need to improve the patient experience, and a technological solution like speech analytics software can make a huge, positive impact, not just on your patients, but also on your revenue cycle performance. Patient financial responsibility is increasing significantly. Providers who implement technology solutions to enhance the patient experience provide options to patients so patient can pay when, how and how much they want. Patient loyalty and collections will increase with the help of technological solutions. Robust technology can help you positively engage patients, delivering to them an understanding of their outstanding financial responsibilities and a more positive feeling about their overall care. The more time you spend in meaningful conversation with patients, the more productive your efforts will be and the more your revenue will grow. There is no changing the uptick in the increase of patient financial responsibility, but finding consumer friendly solutions and implementing them will increase efficiency and reduce account touches and resources. We're confident that we can identify specific ways to improve your self pay performance. All it takes is a thirty-minute call with one of our experts to learn what it takes to take your revenue cycle to new levels.